Ruben Ruzafa from Spain and Carina Wasle of Austria captured the third-annual XTERRA Reunion off-road triathlon elite titles for the second year in a row on Easter Sunday, April 16, 2017. It’s the 24th career XTERRA major win for Ruzafa and the 15th for Wasle. 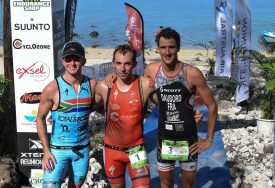 La Saline les Bains (Trou d’eau) – Reunion Island – Ruben Ruzafa from Spain and Carina Wasle of Austria captured the third-annual XTERRA Reunion off-road triathlon elite titles for the second year in a row on Easter Sunday, April 16, 2017. It’s the 24th career XTERRA major win for Ruzafa and the 15th for Wasle. Ruzafa’s winning time of 2:18:50 was more than two-minutes ahead of Frenchman Brice Daubord and four-minutes in front of 2015 Reunion Champ Bradley Weiss. “It was a great victory, but it was hard-earned,” posted Ruzafa to his twitter account. In the men’s race Daubord was first out of the water in 20:18 followed closely by Weiss then Ruzafa 38-seconds later. Daubord’s lead didn’t last long as the four-time champion of France’s cross-country triathlon championship suffered a brief mechanical issue, giving way to Ruzafa and Weiss. From there Ruzafa posted the fastest split of the day in 1:11:23, more than two-minutes quicker than Weiss, and took a lead into the run he would not relinquish. “Having Ruben in a race always changes the dynamics, including my race tactics, and I was determined to give him everything I had on the bike,” said Weiss. Ruzafa’s lead grew to about 40-seconds on Weiss after a technical single-track section, and Ruzafa began the run with a two-minute lead. Nico Sterk finished eight-minutes behind Weiss in fourth, with Dominik Wychera in 5th. As for Wasle, she went relatively unchallenged as South African Vicky Van Der Merwe, who placed 4th at XTERRA South Africa in February, had a tough fall on the bike that made for a long day. Truly a gutsy performance for Van Der Merwe, who basically ran nine miles with a broken wrist, “and massive thanks to organizers and doctors for looking after me so well,” she added. More than 500 participants took part in the weekend events, include 180 kids on Saturday. XTERRA Reunion was the 10th of 41 events where amateur athletes from around the world could qualify to race at the 22nd annual XTERRA World Championship in Maui on October 29.